I gave the Tatamy Harvey Kimono to the expectant mom earlier this week, and she seemed really delighted with that cute little sweater! While excited about Harvey, she did express to me that she wanted a little hat for her boy for the fall. I sprung into action! My friend is a beginner knitter, and following the whole “teach a man how to fish” mentality, I hit Windsor Button for basic hat supplies. The following day she was set up with a skein of Debbie Bliss Baby Cashmerino, some Clover US 3 circs, and a basic Debbie Bliss baby hat pattern (my friend is currently more comfortable with back-and-forth knitting, so Debbie Bliss was perfect). But I couldn’t well enough leave things at that. Of course I wanted to knit her baby a hat, too! Since I was already at Windsor Button, I was able to pick out and buy all the necessary supplies in an instant! I turned to Sublime. Yes, the same Sublime about which I was complaining just a few months ago. It’s the cute babies, I tell you! They get me every. single. time! This time around I didn’t muck around with altering the pattern for a different gauge, though, and my yarn choice was much more appropriate than Elann.com Lara. And things worked out just fine! Pattern: Retro Flying Helmet from the Little Sublime Hand Knit Book. I knit the 6-12 months size. The hat circumference came out to be 15¾”, exactly as specified in the pattern. I knit the pattern as written except for the main stockinette portion, which I worked in the round rather than flat. I still found the instructions a little bit awkward and the absence of diagrams annoying when it was time to put the whole thing together. But overall, not nearly as bad as when I was struggling with the Lifeguard helmet & Tugboat coat (which leads me to believe it was more the yarn and pattern modifications than the pattern itself). Yarn: Sublime Extra Fine Merino Wool DK, shade 64 (plume). I needed to dip into a second skein for the crown decreases, even though the pattern specified that I’d only need 1 skein. Good thing I was able to find a second skein of the same dye lot at Windsor Button! Whew! Needles: Whatever the pattern specified, I think US 3 and US 6. My gauge was as specified, too (22 sts and 28 rows per 4″). While the finished hat is cute, it doesn’t look like much without a cute baby wearing it. A scarf stuffed inside will have to substitute for now :). I love the color you picked. Teal is one my favorite baby colors. That hat pattern is so cute, especially on. 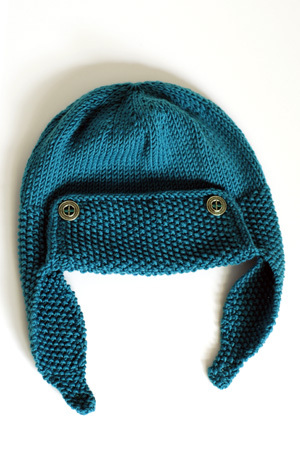 I seldom knit the same thing more than once, but the Retro Flying Helmet has been so enthusiastically received by moms, and so adorably worn by babies (it’s cute in the girls’ version, too) that I’ve made it four times – so far. The right buttons really add the perfect touch, don’t you think? Your forehead flap edging came out particularly well – did you follow the directions or tweak? Very nice hat! I am too close to Windsor Button. It is always a temptation to go during lunch and see if I can find a treasure! that hat is so freakin adorable! perfect color choice. Oh my, I can’t wait to knit this one! It has got to be the cutest (non-silly) baby hat I’ve seen. It came out beautifully, I love the color too. Love it! Fantastic shade of blue/green and the style is sharp. That child is going to look fantastic in it. Very cute hat. I will have to remember that pattern next time I need a baby hat. It is so cute! Definitely a fun and unique little baby hat. I’m sure your friend will love it too! That is so darn cute. Baby knits are the best. Oh this is awesome! You know I’m crazy about that color too! Adorable! I love baby hats that emphasize the roundness of their heads and fat little cheeks. Your color choice was perfect too. 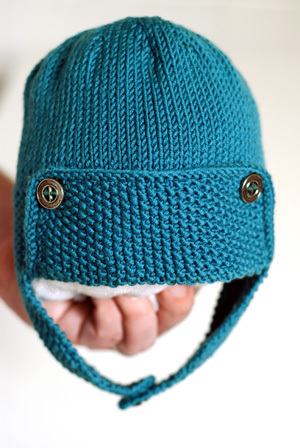 Love the Sublime baby patterns…the hat is adorable…and love the color! It’s really adorable! I love the color. Sublime does know how to find the cutest kids! And the buttons and hat look great. Oh my freakin’ God, that is the cutest hat EVER!! EVER, I say! Oh, MAN, I LOVE IT! The color is fabulous!